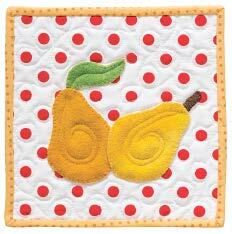 Make an exceptionally cute little quilt that can be used by itself or with the other Kitchen Quilts. This small quilt project is perfect for any skill level. Learn how to hand applique wool in class. Each student has the opportunity to complete the applique on this small quilt as shown on page 59.
made, and background prepared (page 17). Set up common pressing stations. 7. Layer, baste, quilt, and bind as there is time in class.